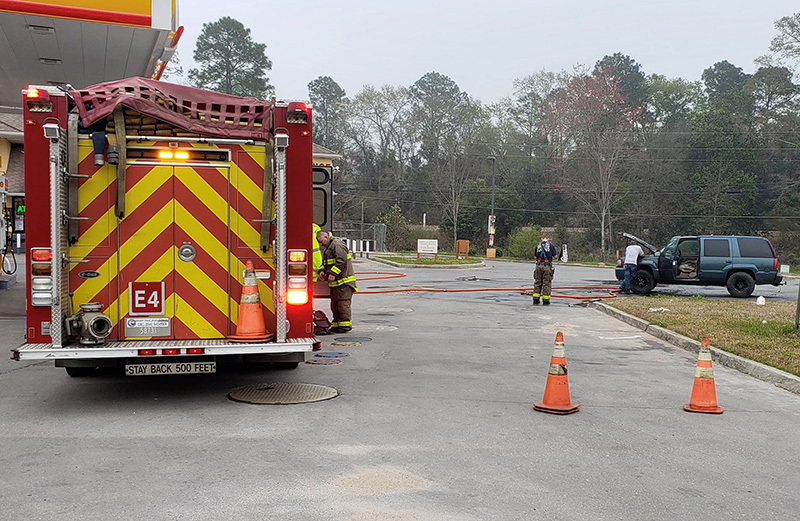 Cantonment firefighters responded to a vehicle fire Sunday morning at the Shell gas station in the 700 block of North Highway 29. They quickly extinguished the fire, which originated in the engine compartment. 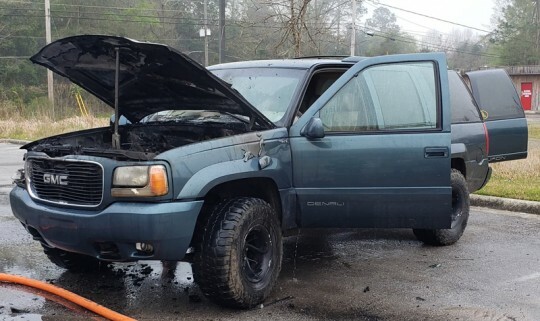 Pictured top: A vehicle fire Sunday morning at a Highway 29 gas station in Cantonment (photo by Cynthia Bowers). Pictured below: Firefighters were able to put out of the fire quickly. NorthEscambia.com photos by Kristi Barbour, click to enlarge. 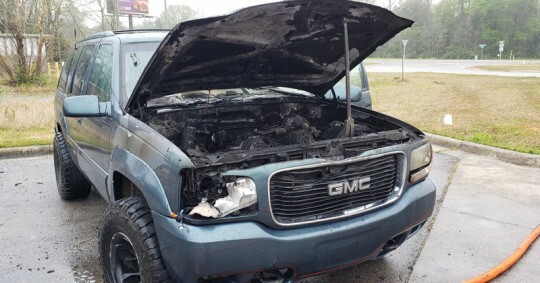 My truck was not a total loss thank God if it had not been for Charles Kettering and Bryan it would have been Charles put the only fire extinguisher that the store had inside and outside on it and saved the rest iof my truck I need a wiring harness and some more odds and ins pieces if anyone knows where I can find them.. I would like to know why the store didn’t have more fire extinguisher. Not even one in the kitchen..
An old GMC Denali with large tires. Those things were nice when they came out but hunks of junk under the engine. 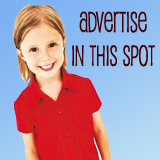 Kathy Elliot, I’m glad your son Bryan Faircloth went to help as well. I’m glad you mentioned his name in an effort to give him kudos. This day and age people just stand around and whip out their smart phones and film tragic accidents. It’s a sad state of affairs created by social media. Thank Bryan Faircloth. You are better than most of the “men” of this generation. Glad everyone was okay, what a shame about about the truck though, hard to find a clean Old Body Style Denali like that. Do yall think its a total loss? Thankfully nobody injured and no damage to the Shell station. 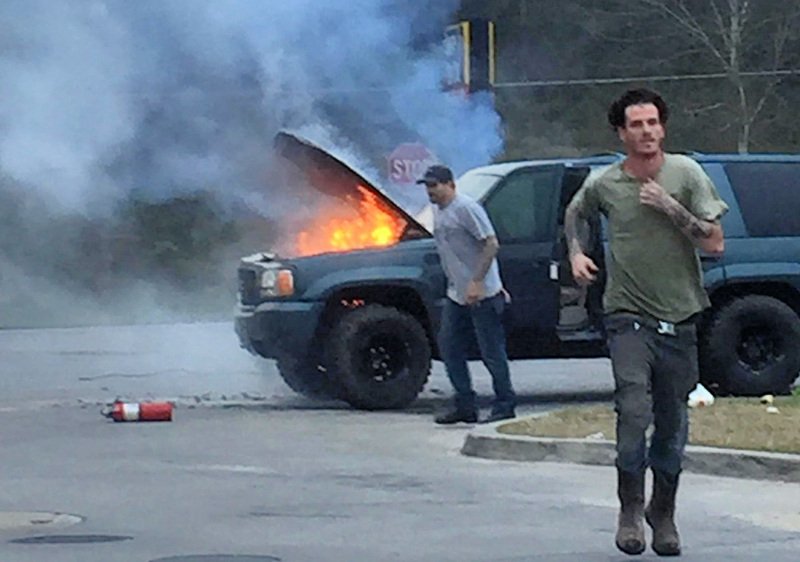 Have seen a few vehicles catch fire and it is simply amazing how quickly the flames and toxins can spread. So much interior stuff of plastic and foam and combustible materials nowadays. Thanks to the First Responders and the driver of GMC for making it less bad than could have been. So glad my son Bryan Faircloth saw this and went to help, and then got himself safe.